As with any new Notrax® innovation – the premise for the new product design is clear: maximising the level of comfort and safety for standing workers. In order to bring a truly new innovation to the market, we accepted the challenge to design our bestselling product, the 479 Cushion Trax®, into a modular and flexible solution for extreme industrial workstation applications. 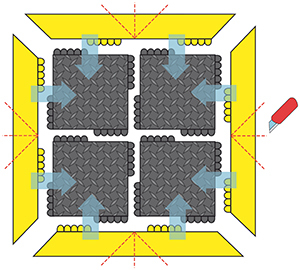 In order to surpass the maximum width of the 479 Cushion Trax® of 152cm, we made the 570 De-Flex™ a 45cm x 45cm modular tile that can be easily assembled for coverage of large areas, around corners and long aisles. Although the overall weight of 16kg/m² is almost triple compared to 5.5kg/m² of the 479 Cushion Trax®, the 45cm x 45cm tiles are easier to handle weighing in at just 3.3kg per tile. 144 hard bulleted domes beneath the surface force the mat to continually bend and ‘flex’ with every movement enhanced even more by the natural resilience and ‘deflection’ of the rubber compound. The first seamless universal interlocking system simplifies installation, yet the double-lock technique is extremely strong and will hold even in the most difficult conditions. Available in a range of specialised rubber compounds for general purpose applications, resistance to industrial oils, ESD static dissipative, and fire-retardant applications. 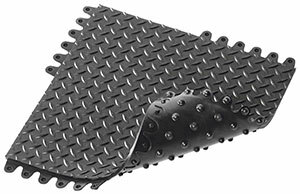 Also available with Grip Step® II for extremely slippery areas. The 570 De-Flex™ has the first seamless universal interlocking system on all sides simplifying the installation as the tiles and safety ramps will fit together any way. 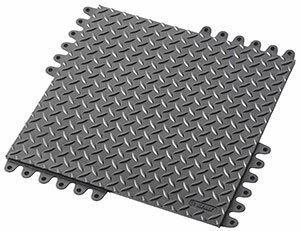 Simply lay and double lock these handy tiles together to assemble a matting solution in any direction or shape. The connection is completely seamless and doesn’t impact the level of comfort. The double-lock is extremely strong and will hold even in the most difficult conditions. Extended bevelled ramps prevent tripping and allow cart access and are easily customised for corners. The 144 bulleted domes underneath the mat allow it to continually bend and ‘flex’ with every movement while distributing weight evenly to allow the worker to stand steadily. The 19mm thick platform elevates and insulates the worker from the hard ground. Made from a durable rubber compound that provides a natural rebound resilience and creates an energising rebound effect or ‘deflection’ that stimulates automatic balance checks to improve posture and constant micro movements to maintain blood flow. Too much cushioning can have a negative effect. Too great an amount of softness will cause excessive fatigue because it overworks the muscles. Think of it like jogging in soft sand as an extreme example of this concept. The De-Flex provides the right amount of comfort to ensure a comfortable standing experience. The diamond plate surface provides traction yet allows easy twist turns for freedom of movement for dynamic workstations. 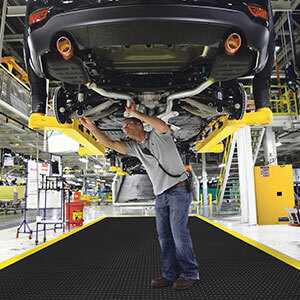 The composition of the material and surface pattern significantly influences the mechanical behaviour of mats. Due to the ‘rebound’ and flexibility of the De-Flex, it is ideal for providing comfort during turning, walking, and other movement.